Join the revolution with The New York Times best-selling author Richard Baker! 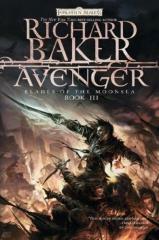 In Avenger, the final volume in the epic adventures of the Blades of the Moonsea, Geran violates his exile to stalk the streets of his former home, hunting down the one who hurt his family and rallying the oppressed people of Hulburg. But Geran's enemies are as numerous as the laws he breaks seeking revenge, and each and every one of them is determined to see him dead. Blades of the Moonsea is the first series written entirely in the new edition of the Forgotten Realms campaign setting, penned by one of its primary creators. Award-winning designer and New York Times best-selling author Richard Baker's Avenger goes to a place and time no Forgotten Realms series has gone before.